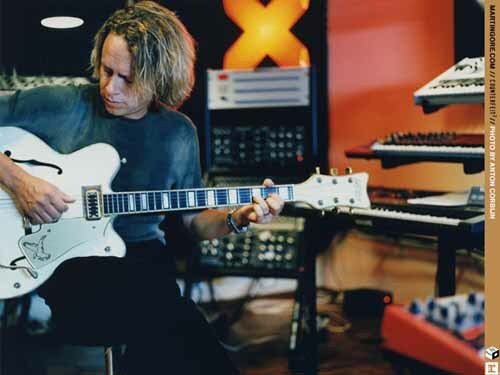 Composition of Sound was formed in 1980 in Basildon, Essex, by guitarist/vocalists Andy Fletcher and Martin Gore and keyboardist Vince Clarke. After recruiting David Gahan, the group abandoned their guitars for synthesizers, changed the band's name, and became an all-electronic band entitled Depeche Mode. For this unusual approach, Depeche Mode earned a loyal London following, and within a year of their formation, were signed to Mute Records. Depeche Mode's first single "Dreaming of Me" was a minor U.K. hit. It was followed by "New Life", which climbed to No.11, and by "Just Can't Get Enough", which cracked the British Top Ten. Speak & Spell, Depeche Mode's debut album, was released in November of 1981. Signed to Sire Records in the U.S., Depeche Mode found initial exposure for their music with club audiences. "Just Can't Get Enough" became a major dance hit, receiving airplay on American alternative radio stations. After a tour of England and Europe, Vince Clark left Depeche Mode to form Yazoo. Alan Wilder then joined the band as the group released its fourth single "The Meaning of Love". A second hit album titled "A Broken Frame" was then released in 1982. In 1983, Depeche Mode released "Construction Time Again", which contained the dance favorite "Everything Counts". -side, "But Not Tonight", (a throwaway song that was recorded in one day), the band's displeasure was evident. Following the Black Celebration Tour, their most successful American tour to that date, the band followed it up with "Music for the Masses". Released in 1987, Depeche Mode went with David Bascombe as their new producer, wanting a fresh start after almost aborting the "Black Celebration" sessions. "Strangelove", the album's first single, had no less than 14 different remixes. "Music for the Masses" itself had struggled to reach the UK Top Ten, and "Little 15", released only in Germany, scraped no higher than number 60, as a foreign release. But still, Depeche Mode continued to have higher concert attendance figures than album sales. After an extensive world tour, Depeche Mode played their 101'st concert at a sold out Pasadena Rose Bowl in front of 70,000 fans. A live album and video, entitled "101" was then released in 1988, warming fans up for Depeche Mode's breakthough album "Violator". "Personal Jesus", the first single from this album, was a huge success, becoming one of the largest selling CD singles in U.S. history, and gave Depeche Mode their first U.S. gold single. Then followed "Enjoy the Silence", a massive hit, which has become Depeche Mode's trademark song. Depeche even whipped 17,000 fans in L.A. into a near riot at a in-store autograph signing to promote the release of Violator. As fast as the ticket offices opened, the demand for the "World Violation Tour" swamped them. In New York, Depeche sold 40,000 tickets for their Giants Stadium show within 8 hours and 48,000 tickets to the Dodger Stadium show in L.A. were sold within one hour of going on sale. But not all was well, frayed nerves, the wear and tear of touring, and internal battles caused Depeche Mode to part company at the end of the Violator Tour, not knowing if they were ever to work together again. Dave re-located to L.A. while the other members concentrated on their families. But in 1992, when Dave felt he didn't want to make another "dance" record with Depeche, Martin sent a demo comprised of "electrifying, bluesy" songs for the next album, which Dave described as "a total relief, soaring, majestic, beautiful". Not only did these songs match Dave's dreams, it equalled them. Dave had now felt that Depeche was pushing the limits of their music further, which he had been wanting for a few years now. In 1993, after a three year period between albums, Depeche Mode released "Songs of Faith and Devotion", a much more rock oriented approach to their music. This would be the first Mode album that would utilize live drums, as well as outside musicians. With "I Feel You" as the first single, and a much anticipated album release, SOFAD debuted at #1 on Billboard's Top 100 and on the British charts as well. It was the first truly "alternative" album to ever achieve this distinguished double. It remained on top for just one week, and by November, it had slipped so swiftly that "Rolling Stone" had spotted the album in the bargain bins. But none the less, Depeche set out on a extensive 14 month world tour, leading the band to such places as South Africa, Australia, Hong Kong, and South America. Even with the quick demise of Songs of Faith and Devotion, Depeche Mode continued to sell out shows in North America and Europe. The band has somewhat become a permanent attraction, in which album chart positions don't affect their concert attendance figures. On June 1st/1995, keyboardist/drummer Alan Wilder decided to leave Depeche Mode, stating unsatisfactory internal working conditions as the reason why he left the band. Fletch, Martin, and Dave continued on as Depeche Mode and they completed recording a new album with producer Tim Simenon in London. On February 3/1997, Depeche Mode released their first single in more than three years; "Barrel of a Gun", along with it's b-side track "Painkiller". Depeche Mode released their new album, "Ultra", on April 14/1997, debuting at Number 5 of the US Billboard Record Charts. The album gained platinum status in Spain, Sweden, Germany, France, and the UK, along with gold status in Italy, Hong Kong, and Canada. 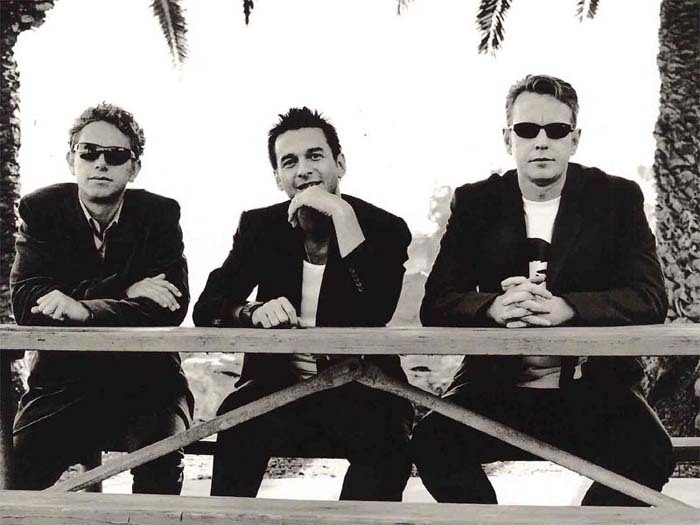 Deciding not to tour in support of 'Ultra', Depeche Mode spent from November of 1996 to July 1997 promoting the album, giving over 250 interviews, along with playing live on various television shows in Europe and the US. Other promotional appearances included playing live on 'The Tonight Show with Jay Leno' on May 15/97, as well as answering questions on a live Internet broadcast from the House of Blues. Along with this, Depeche Mode unveiled their own website, www.depechemode.com. The band conducted two album launch parties, one at Adrenaline Village in Battersea on April 10/97, and the other at the Shrine Expo Hall in Los Angeles on May 16/97. The band played the same song set for both shows, consisting of four tracks from Ultra (Barrel of a Gun, It's No Good, Useless, and Home), along with Never Let Me Down Again. In September of 1998, Depeche Mode returned to the studio to work on a few new tracks, which were to be included on the 2 disc singles compilation "The Singles 86>98". Containing the new track "Only When I Lose Myself", the compilation also included 20 other tracks, consisting of all the bands releases from Black Celebration to 1997's Ultra. Deciding not to pass up another opportunity to tour, and the fact that all band members were now ready to take up touring again, Depeche Mode embarked on an extensive 4 month tour of Europe and North America, their first in five years. This tour marked the first time that the band have ever played live to audiences in Latvia, Estonia, and Russia, ending their 18 year wait for the band to play a concert in their countries. The setlist heavily consisted of the band's singles from 1986 to 1998, but also included a few old surprises, like Somebody and Just Can't Get Enough. The tour marked a few firsts for the band, not only did they played for the first time in Russia, but the band also performed at the "1998 KROQ Almost Acoustic X-mas" in Los Angeles, and on the "Late Night With David Letterman Show" in November. After ending their tour in Anaheim on December 22, 1998, Depeche Mode are currently working on a new album with producer Mark Bell, and we should be expecting a release sometime in the Spring of 2001. Stay tuned!!! David Gahan: : " "I wasn't very proud of myself for a long time and all that stuff that was happening to me, well, I wasn't able to see anything good anymore. It clouds your vision if you become an addict and use drugs and alcohol to function with and to cover-up, to mask yourself, and you're never going to find out who you really are and what you really want. We stopped for a long time after the tour and I saw what I was and I didn't like it. I had long enough to see it but it took a while before I realised it." David Gahan: : " I'm happy to have my life back." Alex: Why did you start your own label, what idea moved you? Andy Fletcher: " I think it’s just the same, I think that much of it is like the chicken and the egg. Actually, it’s what came first is what made me start the label is that I’ve found this band Client. I really like their rocket songs. And so I had to decide what I was going to do with them. And I decided to form a label. So it was that I formed the label and then signed Client."